This chapter explains how to tune the operating system for optimal performance of Oracle Database. Operating systems and device controllers provide data caches that do not directly conflict with Oracle Database cache management. Nonetheless, these structures can consume resources while offering little or no performance benefit. This situation is most noticeable when database files are stored in a Linux or UNIX file system. By default, all database I/O goes through the file system cache. On some Linux and UNIX systems, direct I/O is available to the filestore. This arrangement allows the database files to be accessed within the file system, bypassing the file system cache. Direct I/O saves CPU resources and allows the file system cache to be dedicated to non-database activity, such as program texts and spool files. This problem does not occur on Windows. All file requests by the database bypass the caches in the file system. In some cases the database can cache parallel query data in the database buffer cache instead of performing direct reads from disk into the PGA. This configuration may be appropriate when the database servers have a large amount of memory. See Oracle Database VLDB and Partitioning Guide to learn more using parallel execution. You may want to cache but not all files at the operating system level. With synchronous I/O, when an I/O request is submitted to the operating system, the writing process blocks until the write is confirmed as complete. It can then continue processing. With asynchronous I/O, processing continues while the I/O request is submitted and processed. Use asynchronous I/O when possible to avoid bottlenecks. You can use the FILESYSTEMIO_OPTIONS initialization parameter to enable or disable asynchronous I/O or direct I/O on file system files. This parameter is platform-specific and has a default value that is best for a particular platform. In some Network File Storage (NFS) server environments, performance may be impaired if a large number of asynchronous I/O requests are made within a short period of time. In such cases, use the DNFS_BATCH_SIZE initialization parameter to improve performance and increase stability on your system by limiting the number of I/Os issued by an Oracle process. The DNFS_BATCH_SIZE initialization parameter controls the number of asynchronous I/Os that can be queued by an Oracle foreground process when Direct NFS Client is enabled. In environments where the NFS server cannot handle a large number of outstanding asynchronous I/O requests, Oracle recommends setting this parameter to a value of 128. You can then increase or decrease its value based on the performance of your NFS server. The default setting for the DNFS_BATCH_SIZE initialization parameter is 4096. The recommended value of 128 is only applicable on systems where the NFS server cannot handle a large number of asynchronous I/O requests and severe latency is detected. Memory usage is affected by both buffer cache limits and initialization parameters. The UNIX buffer cache consumes operating system memory resources. Although in some versions of UNIX, the UNIX buffer cache may be allocated a set amount of memory, it is common today for more sophisticated memory management mechanisms to be used. Typically, these will allow free memory pages to be used to cache I/O. In such systems, it is common for operating system reporting tools to show that there is no free memory, which is not generally a problem. If processes require more memory, the memory caching I/O data is usually released to allow the process memory to be allocated. In Oracle Database, the PGA_AGGREGATE_TARGET initialization parameter gives greater control over a session's memory usage. Oracle Database runs within domains, and within these other less complete partitioning constructs, as long as the allocation of partitioned memory (RAM) resources is fixed, not dynamic. Oracle Database is not supported for use with any UNIX operating system resource manager's memory management and allocation facility. Oracle Database Resource Manager, which provides resource allocation capabilities within an Oracle database instance, cannot be used with any operating system resource manager. If you have multiple instances on a node, and you want to distribute resources among them, then each instance should be assigned to a dedicated operating-system resource manager group or managed entity. To run multiple instances in the managed entity, use instance caging to manage how the CPU resources within the managed entity should be distributed among the instances. When Oracle Database Resource Manager is managing CPU resources, it expects a fixed amount of CPU resources for the instance. Without instance caging, it expects the available CPU resources to be equal to the number of CPUs in the managed entity. With instance caging, it expects the available CPU resources to be equal to the value of the CPU_COUNT initialization parameter. If there are less CPU resources than expected, then Oracle Database Resource Manager is not as effective at enforcing the resource allocations in the resource plan. For a complete list of operating system resource management and resource allocation and deallocation features that work with Oracle Database and Oracle Database Resource Manager, see your systems vendor and your Oracle representative. Oracle does not certify these system features for compatibility with specific release levels. Oracle Database Administrator's Guide for information about Oracle Database Resource Manager. Oracle Database Administrator's Guide for information about instance caging. On UNIX systems, try to establish a good ratio between the amount of time the operating system spends fulfilling system calls and doing process scheduling and the amount of time the application runs. The goal should be to run most of the time in application mode, also called user mode, rather than system mode. On Windows systems, as with UNIX-based systems, establish an appropriate ratio between time in application mode and time in system mode. You can easily monitor many factors with the Windows administrative performance tool: CPU, network, I/O, and memory are all displayed on the same graph to assist you in avoiding bottlenecks in any of these areas. Consider the paging parameters on a mainframe, and remember that Oracle Database can exploit a very large working set. Free memory in HP OpenVMS environments is actually memory that is not mapped to any operating system process. On a busy system, free memory likely contains a page belonging to one or more currently active process. When that access occurs, a soft page fault takes place, and the page is included in the working set for the process. If the process cannot expand its working set, then one of the pages currently mapped by the process must be moved to the free set. Any number of processes might have pages of shared memory within their working sets. The sum of the sizes of the working sets can thus markedly exceed the available memory. When the Oracle server is running, the SGA, the Oracle Database kernel code, and the Oracle Forms run-time executable are normally all sharable and account for perhaps 80% or 90% of the pages accessed. You can capture various workload snapshots using the Automatic Workload Repository, Statspack, or the UTLBSTAT/UTLESTAT utility. Operating system utilities—such as vmstat, sar, and iostat on UNIX and the administrative performance monitoring tool on Windows—can be used along with the V$OSSTAT or V$SYSMETRIC_HISTORY view during the same time interval as Automatic Workload Repository, Statspack, or UTLBSTAT/UTLESTAT to provide a complimentary view of the overall statistics. Workload is an important factor when evaluating your system's level of CPU utilization. During peak workload hours, 90% CPU utilization with 10% idle and waiting time can be acceptable. Even 30% utilization at a time of low workload can be understandable. However, if your system shows high utilization at normal workload, then there is no room for a peak workload. 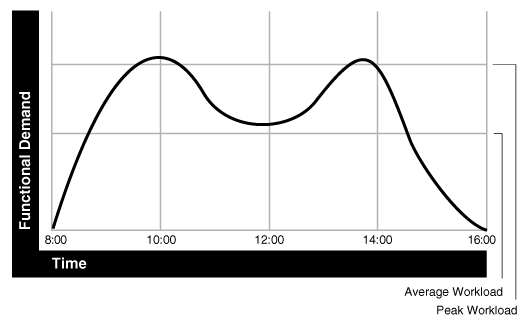 For example, Figure 18-1 illustrates workload over time for an application having peak periods at 10:00 AM and 2:00 PM. Description of "Figure 18-1 Average Workload and Peak Workload"
However, usage patterns are not constant and in this context, 20 transactions a minute can be understood as merely a minimum requirement. If the peak rate you need to achieve is 120 transactions a minute, then you must configure a system that can support this peak workload. Detecting and solving CPU problems from excessive consumption, as described in "Finding and Tuning CPU Utilization". Reducing the impact of peak load use patterns by prioritizing CPU resource allocation using Oracle Database Resource Manager, as described in "Managing CPU Resources Using Oracle Database Resource Manager". Using instance caging to limit the number of CPUs that a database instance can use simultaneously when running multiple database instances on a multi-CPU system, as described in "Managing CPU Resources Using Instance Caging". Increasing hardware capacity and improving the system architecture. Every process running on your system affects the available CPU resources. Therefore, tuning non-database factors can also improve database performance. You can use operating system monitoring tools to determine which processes run on the system as a whole. If the system is too heavily loaded, check the memory, I/O, and process management areas described later in this section. You can use tools such as sar -u on many UNIX-based systems to examine the level of CPU utilization on the system. In UNIX, statistics show user time, system time, idle time, and time waiting for I/O. A CPU problem exists if idle time and time waiting for I/O are both close to zero (less than 5%) at a normal or low workload. On Windows, you can use the administrative performance tool to monitor CPU utilization. This utility provides statistics on processor time, user time, privileged time, interrupt time, and DPC time. This document describes how to check system CPU utilization on most UNIX-based and Windows systems. For other platforms, see your operating system documentation. Use the V$OSSTAT view, utilities such as sar or vmstat on UNIX, or the administrative performance tool on Windows, to investigate the cause of paging and swapping. On UNIX, if the processing space becomes too large, then it can result in the page tables becoming too large. This is not an issue on Windows systems. Thrashing is an I/O management issue. Ensure that your workload fits into memory, so the computer is not thrashing (swapping and paging processes in and out of memory). The operating system allocates fixed portions of time during which CPU resources are available to your process. If the process wastes a large portion of each time period checking to ensure that it can run and ensuring that all necessary components are in the computer, then the process might be using only 50% of the time allotted to actually perform work. Check client/server round trips. There is an overhead in processing messages. When an application generates many messages that need to be sent through the network, the latency of sending a message can result in CPU overload. To alleviate this problem, bundle multiple messages rather than perform lots of round trips. For example, you can use array inserts, array fetches, and so on. Several process management issues discussed in this section should be checked. The operating system can spend excessive time scheduling and switching processes. Examine the way in which you are using the operating system, because it is possible that too many processes are in use. On Windows systems, do not overload the server with too many non-database processes. Due to operating system specific characteristics, your system could be spending a lot of time in context switches. Context switching can be expensive, especially with a large SGA. Context switching is not an issue on Windows, which has only one process for each instance. All threads share the same page table. An Oracle process must be able to post another Oracle process (give it a message) and also must be able to wait to be posted. For example, a foreground process may need to post LGWR to tell it to write out all blocks up to a given point so that it can acknowledge a commit. Oracle Database often needs to query the system time for timing information. This can involve an operating system call that incurs a relatively costly context switch. Some platforms implement a memory-mapped timer that uses an address within the processes virtual address space to contain the current time information. Reading the time from this memory-mapped timer is less expensive than the overhead of a context switch for a system call. List I/O is an application programming interface that allows several asynchronous I/O requests to be submitted in a single system call, rather than submitting several I/O requests through separate system calls. The main benefit of this feature is to reduce the number of context switches required. There is a high cost in starting new operating system processes. Developers often create a single-purpose process, exit the process, and then create a new one. This technique re-creates and destroys the process each time, consuming excessive amounts of CPU, especially in applications that have large SGAs. The CPU is needed to build the page tables each time. The problem is aggravated when you pin or lock shared memory because you must access every page. For example, if you have a 1 gigabyte SGA, then you might have page table entries for every 4 KB, and a page table entry might be 8 bytes. You could end up with (1 GB / 4 KB) * 8 byte entries. This becomes expensive, because you need to continually ensure that the page table is loaded. If the CPUs run at 100%, then you can use Oracle Database Resource Manager to allocate a maximum amount of CPU to sessions in each consumer group. This feature can ensure that high-priority sessions can run immediately and lower the CPU consumption of low-priority sessions. You can use the Resource Manager directive max_utilization_limit to place a hard limit on the percentage of CPU that a consumer group can use. This feature restricts the CPU consumption of low-priority sessions and can help provide more consistent performance for the workload in a consumer group. Starting with Oracle Database 11g Release 2 (11.2.0.2), Oracle Database Resource Manager can limit the damage from runaway queries by limiting the maximum execution time for a call, or by moving a long-running query to a lower-priority consumer group. Starting with Oracle Database 11g Release 2 (11.2.0.2), you can use the Resource Manager directive parallel_target_percentage to prevent one consumer group from monopolizing all parallel servers. The database queues parallel statements if they would cause this limit to be exceeded. For example, assume that the target number of parallel servers is 64, and the consumer group ETL has this directive set to 50%. If consumer group ETL is using 30 parallel servers, and if a new parallel statement needs 4 parallel servers, then the database would queue this statement. When running multiple database instances on a single system, the instances compete for CPU resources. One resource-intensive database instance may significantly degrade the performance of the other instances. To avoid this problem, you can use instance caging to limit the number of CPUs that can used by each instance. Oracle Database Resource Manager then allocates CPU among the various database sessions according to the resource plan that you set for the instance, thereby minimizing the likelihood of the instance becoming CPU-bound.